Anastasia is currently a postdoctoral researcher at Naturalis Biodiversity Center in Leiden. I was born in Athens. I studied Biology at the Aristotle University of Thessaloniki (AUTH), where I also carried out my doctoral studies. My PhD thesis was on the taxonomy, biogeography and essential oils of Lamiaceae plants in the East Aegean, a small region lying at the biogeographical border between Europe and Asia. My interest focused mostly on understanding the biogeographical affinities within the East Aegean and exploring the plants’ distribution patterns in relation to habitat and geological substrate in Chios Island, Greece and its neighbouring Çeşme-Karaburun Peninsula, Turkey. While a PhD student, I worked on the research projects Pythagoras I and Pythagoras II, regarding aromatic plants in protected areas of the Natura 2000 Network and the biogeography of Lamiaceae plants in Greece, respectively. I also assisted in teaching two undergraduate courses (Systematic Botany; Biogeography) and two postgraduate courses (Identification and collection of wild plants; The Natura 2000 Network) of the postgraduate programme “Conservation of Biodiversity and Sustainable Exploitation of Native Plants” (BNP), offered at the School of Biology of AUTH. 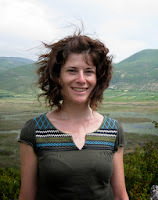 Since 2012, I have been occupied as a plant taxonomist for the POL-AEGIS project, where I was fascinated to work on plant material from all around the Aegean Archipelago and to get a look into the world of pollinators. In my free time I love to discover beautiful and rare plants while mountaineering, jogging, camping and traveling to the islands. Stefanaki, A., Cook C.M., Lanaras, T. & Kokkini, S. 2016. The Oregano plants of Chios Island (Greece): Essential oils of Origanum onites L. growing wild in different habitats. Industrial Crops and Products 82:107-113. Stefanaki, A., Kantsa, A., Tscheulin, T., Charitonidou, M & Petanidou, T. 2015. Lessons from Red Data Books: Plant vulnerability increases with floral complexity. PLOS ONE, 10 (9): e0138414. Stefanaki, A. & Kokkini, S. 2015. Phytogeographical affinities at the crossroads of two continents: Distribution patterns of Lamiaceae in Chios Island (East Aegean Islands, Greece) and Çeşme–Karaburun Peninsula (West Anatolia, Turkey), Systematics and Biodiversity 13:307-325. Theodoridis, S., Stefanaki, A., Tezcan, M., Aki C., Kokkini, S. & Vlachonasios, K. 2012. DNA barcoding in native plants of the Labiatae (Lamiaceae) family from Chios Island (Greece) and the adjacent Çeşme-Karaburun Peninsula (Turkey). Molecular Ecology Resources, 12:620-633. Stefanaki, A., Aki, C., Vlachonasios, K. & Kokkini, S. 2010. Phytogeographic versus political borders: European Union’s Lifelong Learning Programme towards a common concept in the East Aegean (E. Greece, W. Turkey). Fresenius Environmental Bulletin, 19(4a): 696-703. Stefanaki, A. & Kokkini, S. 2009. Origanum sipyleum L., Vulnerable (VU). In: Phitos, D., Constantinidis, T. & Kamari, G. (Eds. ), Red Data Book of Rare and Threatened Plants of Greece, 2: 234-235, Patras. Stefanaki, A. & Kokkini, S. 2009. Sideritis sipylea Boiss., Endangered (EN). In: Phitos, D., Constantinidis, T. & Kamari, G. (Eds. ), Red Data Book of Rare and Threatened Plants of Greece, 2: 310-312, Patras. Stefanaki, A. & Kokkini, S. 2009. Thymus sipyleus Boiss., Vulnerable (VU). In: Phitos, D., Constantinidis, T. & Kamari, G. (Eds. ), Red Data Book of Rare and Threatened Plants of Greece, 2: 355-356, Patras.